Spring is Coming! Look Busy. Posted 3/6/2019 10:43am by John Eisenstein. 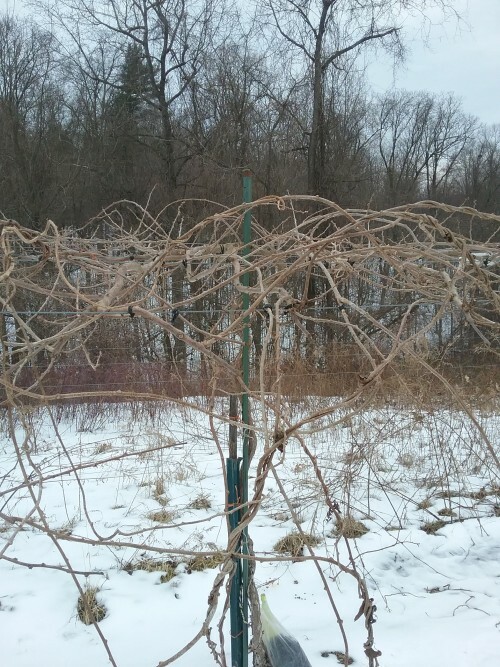 For some reason known only to him, my father decided to festoon this vine with cheerful ribands. The fact that these are easily movable enables us to use the same structure several times in one season. Goats are just a hobby for me, and not part of the farm business. 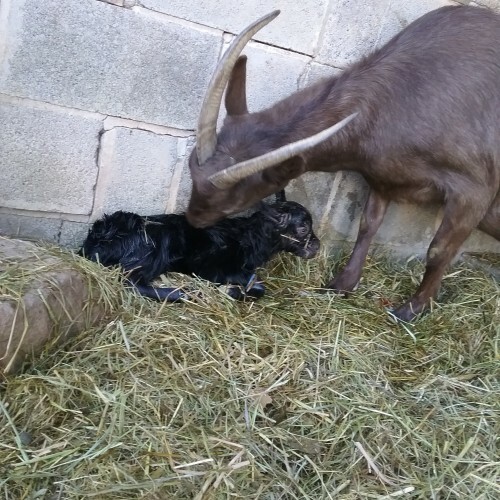 They take up a lot of time and money, but the milk is really first- rate and, now that my own children are young adults, the goats serve as a great source of aggravation. 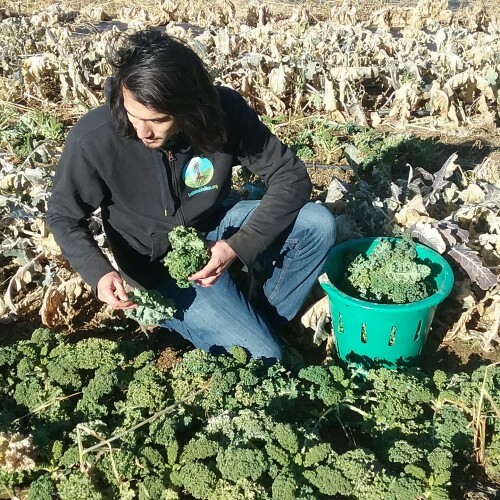 Space in our 2019 harvest share is filling up fast! I recommend not to delay much longer if you plan on joining us this year. You can use this link to go straight to our signup page. 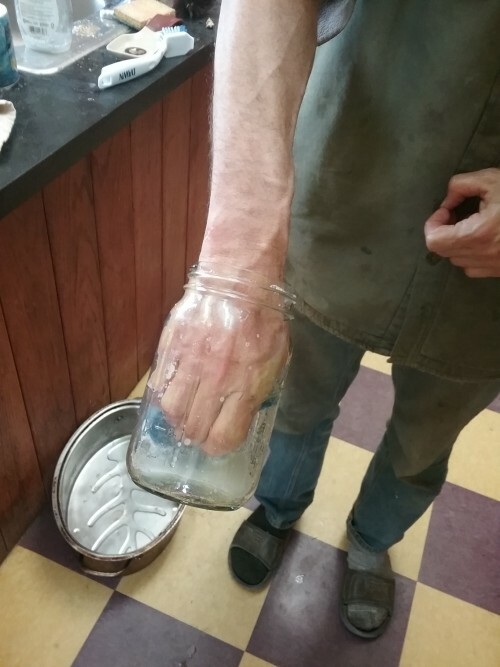 And finally, here is a picture of me with my hand stuck in a mason jar, and my daughter Evelyn refused to help pull it off! Luckily the 911 operator was able to advise me well (she suggested I unclench my fist) and the story had a happy ending. Posted 2/23/2018 11:09am by John Eisenstein. I've been told today is officially CSA day. What does that even mean? Who made it official? Some official somewhere? On what authority? It sounds like a made up holiday to me, like "Presidents' Day" (James Buchanan needs a day? Warren Harding needs a day? What?) or "National Cottage Cheese Appreciation Week". 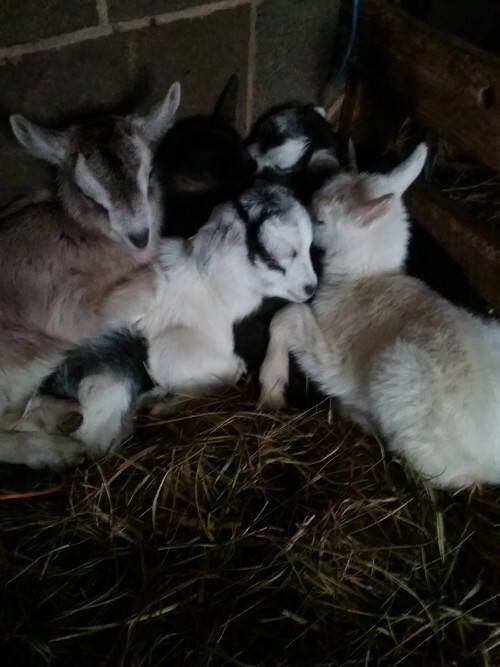 Anyways, my marketing plan tells me I'm supposed to make a big deal out of CSA day, to encourage people to sign up for my CSA, but I don't really like trying to tell people what to do, so instead I'm going to show you a picture of some baby goats. They are all less than a week old and like to form a pile at night in order to stay warm. We now have nine kids. Does anybody want one? 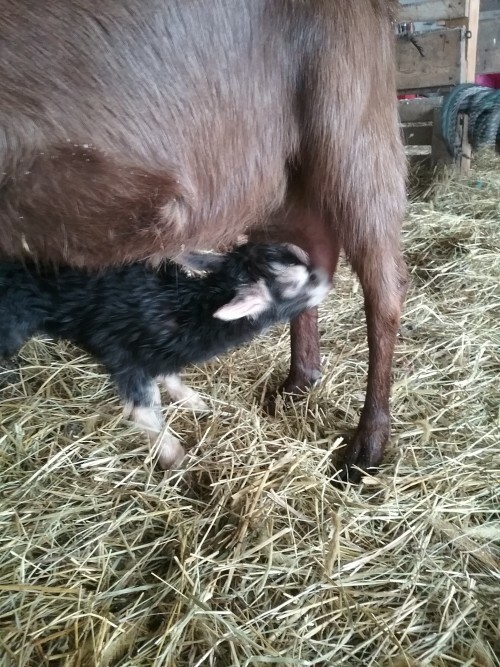 I don't sell dairy products commercially and have no plans to do so, but I love having my own source of fresh milk and butter, and nothing beats keeping goats for aggravation. Today is also the feast day of St. Serenus the Gardener, in addition to being CSA day. Did I mention it was CSA day? In keeping with the theme of new life, we have also started seeding in the greenhouse. 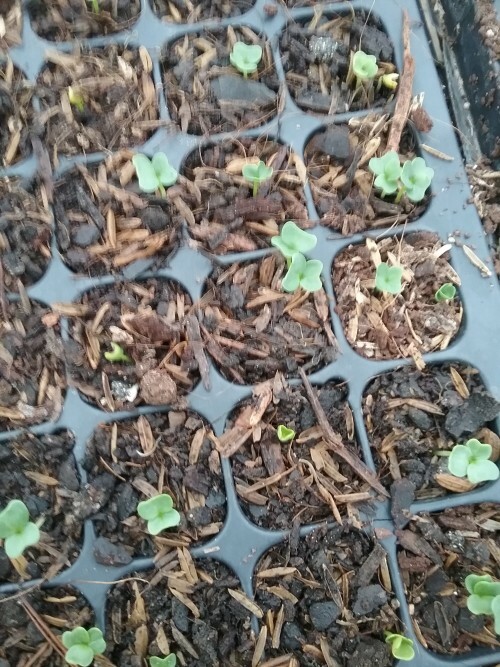 Here are some little tiny kale seedlings just starting to grow. 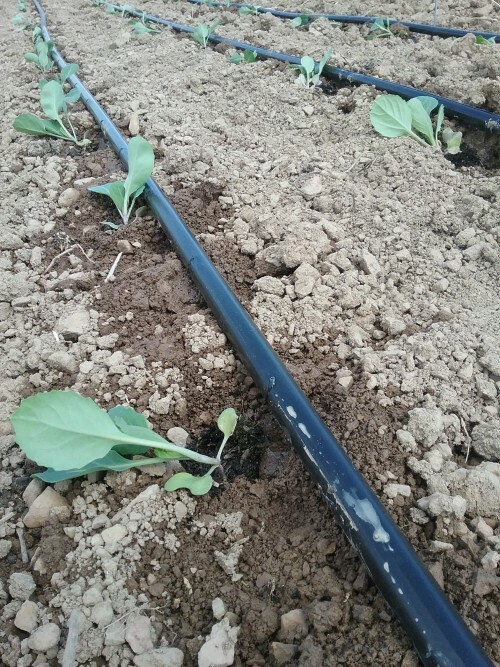 The old name for plants in this family, now known as "brassicas", was "crucifers", because the emerging seedlings look like little crosses. We have also started onions, lettuce, parsley, peppers, tomatoes, Swiss chard, eggplant and shallots. We will be seeding every week from now until August. The end of winter also means for a me a mild feeling of panic, when I realize that things are about to get extremely busy and I haven't finished-- or even started-- many of the things on my winter to- do list. Time to get back to work! 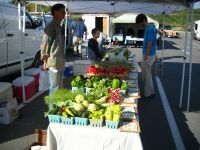 If you want to celebrate CSA day in style, you can click on this link to sign up for our CSA now! Exciting News! Or is it? Posted 1/6/2018 11:07am by John Eisenstein. Hello! A friend of mine once accused me of being a Luddite. Unsure what exactly that was, I proceeded to read an entire book on the subject of the original Luddites (Northern England, beginning of 19th century) called "Rebels Against the Future". Parts of it were extremely boring! Turns out, my friend was right-- I am a Luddite. a portrait of myself and children with some stuff we had lying about in storage. 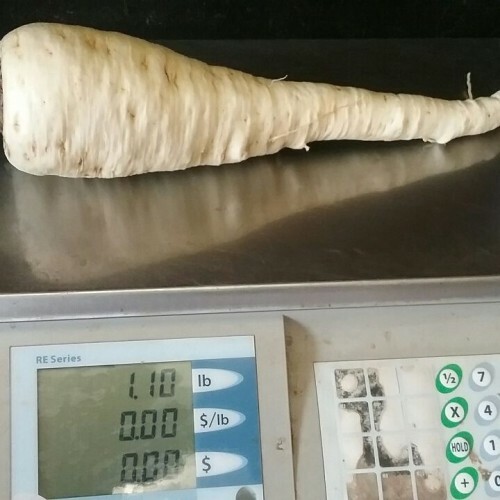 More importantly, we have upgraded our CSA/ harvest share software. You all know that we have long been committed to offering customized boxes and maximum flexibility; the challenge has always been doing so in a way that didn't create too much of a logistical and record keeping nightmare for me. This new software, called "Harvie", is designed specifically for family farms such as ours to make our lives easier while giving you what you expect and deserve. Apparently the experts don't think you have much of an attention span. Anyway, back to business. The upshot of Harvie is that things will be quite similar to what we are doing already-- you still get to choose exactly what you want from what we have available-- with some extra features added in. The only big change is that there is no straight a la carte option. However, since each share size has a biweekly option, and you can skip weeks and reschedule them at will, I believe it will still work well for those people accustomed to a la carte. I go into more detail on our website, also you can visit the Harvie website by clicking here to learn more, or if you wish to sign up for a share right this very instant, click here. If you have any questions let me know and I will find out the answers. Finally, here is our new logo. It's based on a self portrait, more or less. It took me 13 years of being in business to come up with a logo and motto which accurately reflect my philosophy toward business and life. People told me my former business motto- "Our Best Will Have to Do!" was horrible and I should never tell it to anybody! Posted 4/28/2017 6:45am by John Eisenstein. And one for the dreaded pea seed maggot. Which, in a bad year, doesn't leave too many for us. Our first two plantings of peas did well enough, but the third was almost completely destroyed by maggots. So, I replanted in another part of the farm, and didn't tell the maggots. Don't anybody tell the maggots! 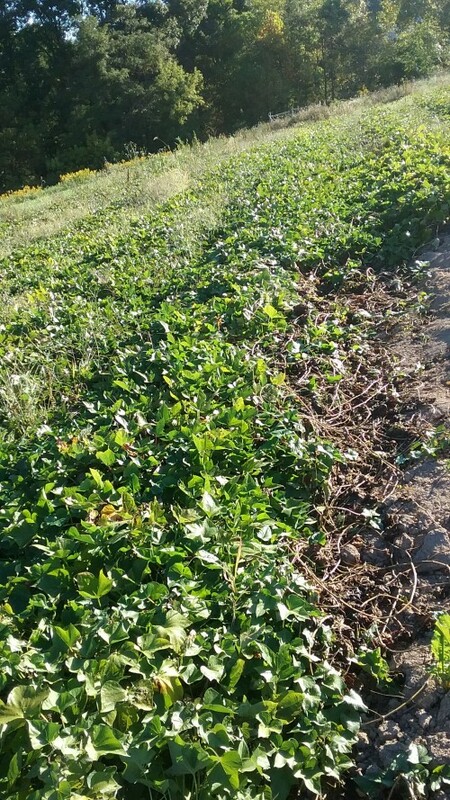 We just mowed it, in preparation for incorporating it into the soil, where the biomass from the rye and nitrogen fixed by the vetch will feed the crop and give us the second best pepper harvest ever! Posted 3/21/2017 5:41am by John Eisenstein. Hello everyone! Lately we've had a few long time shareholders sign up for a couples share, when they had previously gotten the family share, due to their children being adults now and moved out of the house. How quickly they grow up! 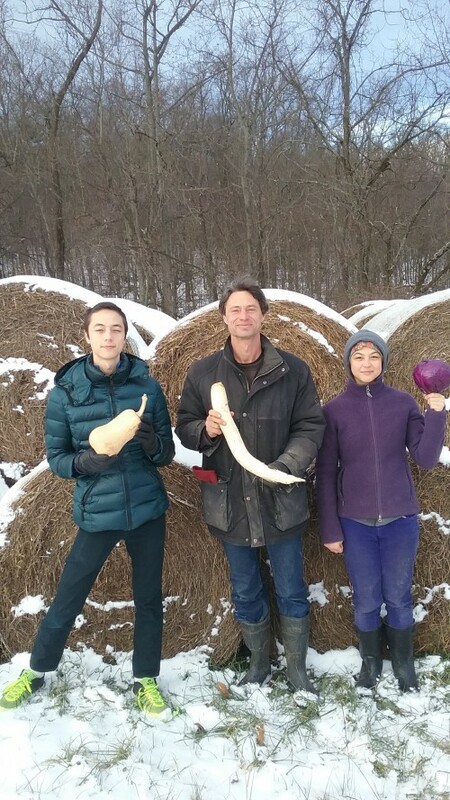 My eldest child is also turning 18 this May and it got me thinking about what impact our vegetables may have had on their lives over the past 11 years we have had a CSA. How many school lunched had carrots or sweet peppers in them instead of chips? How many extra bowls of salad at the dinner table? How many cries of "yuk!" when confronted with a steaming dish of eggplant or Swiss chard? Speaking of growing quickly, despite the snow(! 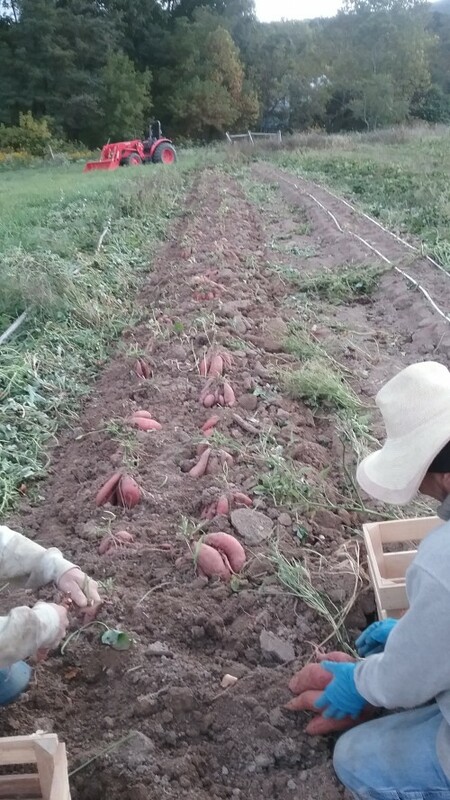 ), we have been busy in the greenhouse and elsewhere. Here are some seedlings a few weeks away from transplanting. Hard to believe that each one will grow up to be a 4 pound cabbage! Especially hard to believe since these are spinach sprouts, not cabbage. We've also been busy pursuing my Belgian endive obsession. For those of you who aren't familiar with it, Belgian endive is a tasty winter treat, grown in a dark heated room from roots harvested the previous Fall. Here is a picture of the endive growing in trays, almost ready for harvest. 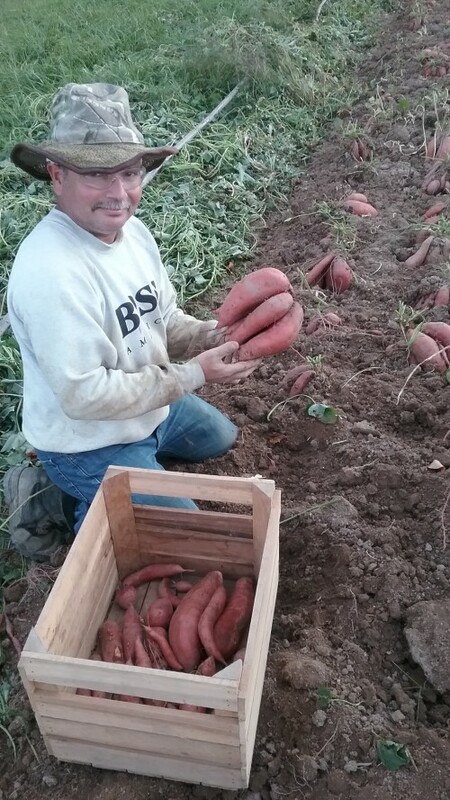 And here is some already harvested. So you have a sense of scale, the gnome is life sized. Unsurpassed for winter salads, and if I ever line up my Autumn ducks sufficiently in a row to offer a winter share, endive will be part of it. Posted 2/27/2016 10:15am by John Eisenstein. This is Ramona's 4th time of becoming a mother and she knows just what to do. I also took a little video of her caring for her kids, but I can't post it here without a lot of bother, so if you want to see it, you'll have to email me and I can send it as an attachment. Huge thank you's to Ken, Rachel, Steve, Ollie, Serena, Emily and Evelyn. Now we begin the work of salvage and reassembly. We'll have another work party when its time to put them back up, stay tuned-- you are invited! Other than that we are busy seeding in the one remaining greenhouse and getting supplies and seeds together for the upcoming growing season. Apparently yesterday was national CSA signup day, which I think is a little silly, but if you haven't yet signed up for the 2016 season, why wait? You can click here to navigate to our signup page. We have added a new delivery location in downtown Harrisburg. Posted 3/21/2015 11:05am by John Eisenstein. It looks bigger in real life. Notice the fine hat Evelyn crocheted for me. I am reminded about the story told of John Adams, who, after being the second president of these United States, retired to his farm in Quincy and, every morning after breakfast, went out to admire his manure pile and chortle with a tankard of hard cider. Now I know just how he must have felt, minus the parts about being president (although I am secretary of the Boalsburg Farmers' Market) and the cider. Of course I am just kidding, I didn't really muck out the stables by hand. Here is a picture of what actually happened. The young man operating the machine with such skill is Suzie's fiancee, who she somehow convinced to come over and do the job for us. So, I'm sure you are wondering what I am planning on doing with all that manure, other than admiring it, and so I'll tell you. 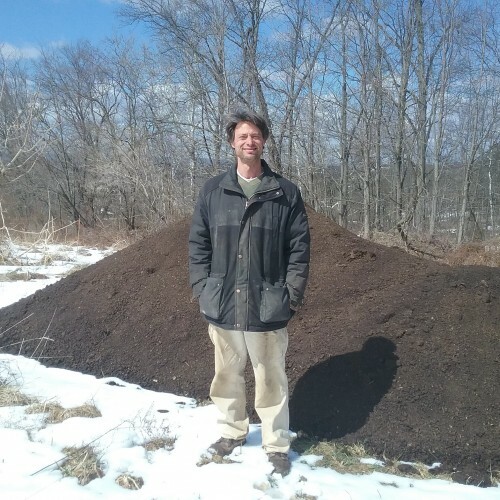 Some of it I will mix with finely chopped green grasses and compost in our static aerated composting facility, and the rest we will let age, like a fine wine, until it is just right for worms. Then it's vermiculture mania! 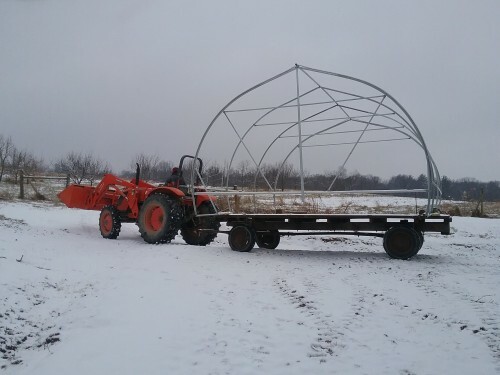 Still haven't signed up for a 2015 farm share? You can do so by clicking here, or, to read more about our share options, click here. Were planning on having the best season ever-- you won't want to miss it! Putting the Old Man to Work. Posted 2/14/2015 6:20pm by John Eisenstein. It isn't spring yet, but the longer days and brighter sun cause hope to spring anew in the heart and unease in the gut, when I realize how much I still have to get done before Spring comes. So, it's back to work despite the cold! My father just got back from three weeks! 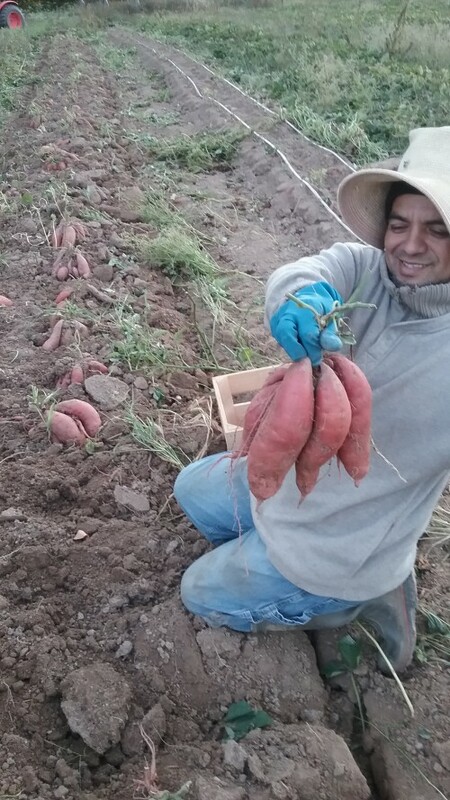 in Mexico, leaving me behind to face the snow and bitter cold with nothing but a thin, watery gruel to eat, so upon his return I wasted no time in putting the old man to work. Here he is sowing a pollinator seed mix. 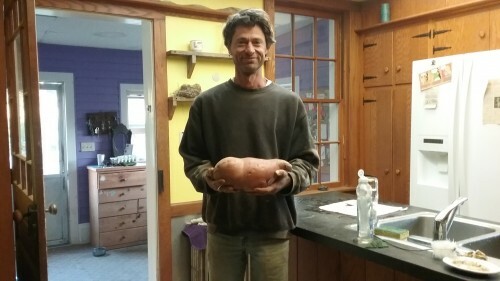 We prepared the ground last fall, and as the snow melts, the frequent freezing and thawing should work the seeds snugly into the earth, and we will have a nice stand of flowering native plants come summer. There are 27 species alltogether in the mix, all selected to support native pollinators and provide habitat for other beneficial insects. 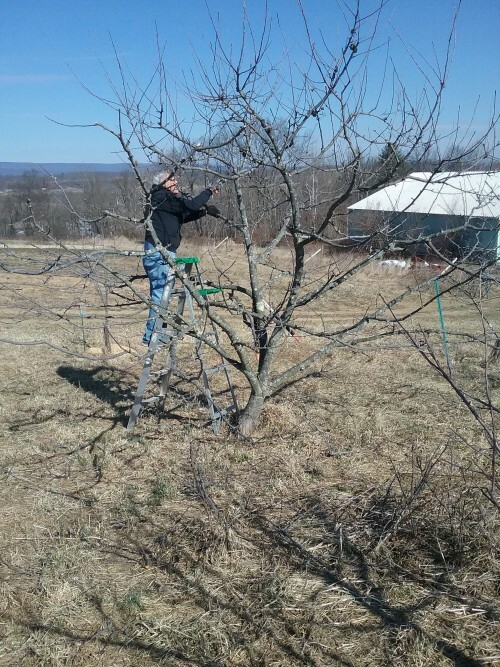 And here is dad again starting to prune the orchard. Its a little early, but we hate feeling rushed, and with 80 or so trees of different kinds, we can no longer do the job in an afternoon. 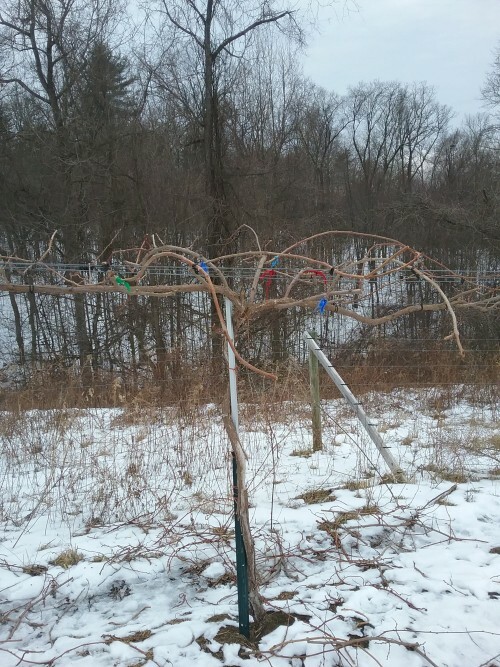 Now that some of the trees are old enough to bear fruit, pruning takes on a new kind of excitement. I've been busy too! With what? I'll tell you later.